One thing I’ve learned in boxing is that you should appreciate transcendent fighters while they’re at their best because those periods are fleeting. I witnessed up close the circus that followed Julio Cesar Chavez wherever he went when he was in the latter stages of his prime. The love of his fans, particularly those from his native Mexico, couldn’t have been more palpable. I also remember a young Oscar De La Hoya bloodying and then overwhelming an aging Chavez in 1996 and again in 1998. The greatness was history. I had a front row seat for the rise and peak of De La Hoya, whose ability to attract fans – particularly female ones – with his boxing skills and charisma was reminiscent of the Beatles. Everyone was swept up in the energy surrounding him at that time. I also remember a young Manny Pacquiao pummeling a faded De La Hoya against the ropes in 2008, which led to the once-great champion’s retirement after eight rounds. 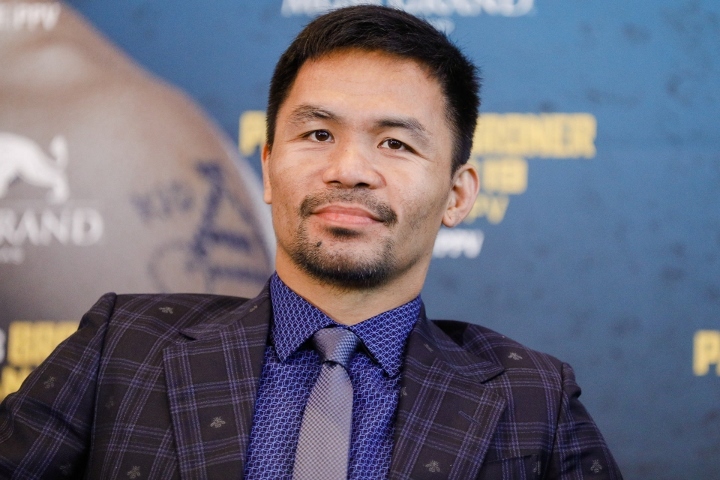 I was in tow when Pacquiao took the United States by storm more than a decade ago, first with his stunning upset of Lehlo Ledwaba in 2001 and then with dominance over his Mexican rivals and knockouts of De La Hoya, Ricky Hatton and Miguel Cotto. The excitement – the frenzy – surrounding the Filipino icon at that time rivaled that of Chavez and De La Hoya. I also remember Juan Manuel Marquez’s one-punch knockout of Pacquiao and his one-sided loss to Floyd Mayweather, stark evidence that his best years were behind him. Such are the cycles of boxing. Pacquiao (60-7-2, 39 knockouts) is 40 now (how is that possible?) but he remains a good fighter. I believe he has a legitimate chance to beat Adrien Broner when they meet on January 19 in Las Vegas, although I fear an ugly loss. And he’s still Manny Pacquiao. His name still carries considerable weight. When he walks up the aisle toward the ring at the MGM Grand Garden Arena to face Broner, the fans on hand will once again feel a rush of excitement. It’s not like it was when a single left hook stole the consciousness of Hatton and rocked the boxing world like few punches before it, though. Those heady days are gone. Now it’s young, gifted fighters like Terence Crawford and Vasyl Lomachenko and Mikey Garcia and Canelo Alvarez who generate the exhilaration once associated with Chavez, De La Hoya and Pacquiao. I would say that Alvarez is the closest to those great fighters in terms of his universal appeal and, obviously, he can fight. He’s a relative babe of 28, good looking and a beast in the ring, attributes that have made him a superstar and stir the masses much as his predecessors did. He’ll soon be 30, though. Then 35. And before we know it he’ll be the old man who passes the torch to a younger rival. Let’s say Alvarez fights twice a year for the next seven years and then retires. That’s only 14 more fights in his career. He has the ability and fighting spirit to pack a lot of thrills into 14 fights but it sure doesn’t seem like a big number, which in some way is sad. The same goes for Crawford, Lomachenko, Garcia and a few others. They aren’t quite the attraction Alvarez is but knowledgeable boxing fans, those who truly love the sport, know what they’re seeing when these stars do their thing. These are true artists, fighters with precious skills that would’ve allowed them to compete against all the legendary champions you can think of. So few fighters can legitimately make that claim. And, again, the reality is that they have a limited number of canvases on which to paint their Hall of Fame legacies. I would suggest that you keep that in mind when you settle in front of your TV or, if you’re fortunate enough, into a seat at an arena or stadium to watch your favorite fighters in action. Stay in the moment, think about what you’re witnessing, savor every second of it. For soon both the fight you’re watching and the careers of the boxers who are creating magic before your eyes will be nothing more than wonderful memories. Michael Rosenthal is the most recent winner of the Boxing Writers Association of America’s Nat Fleischer Award for excellence in boxing journalism. He has covered boxing in Los Angeles and beyond for almost three decades.